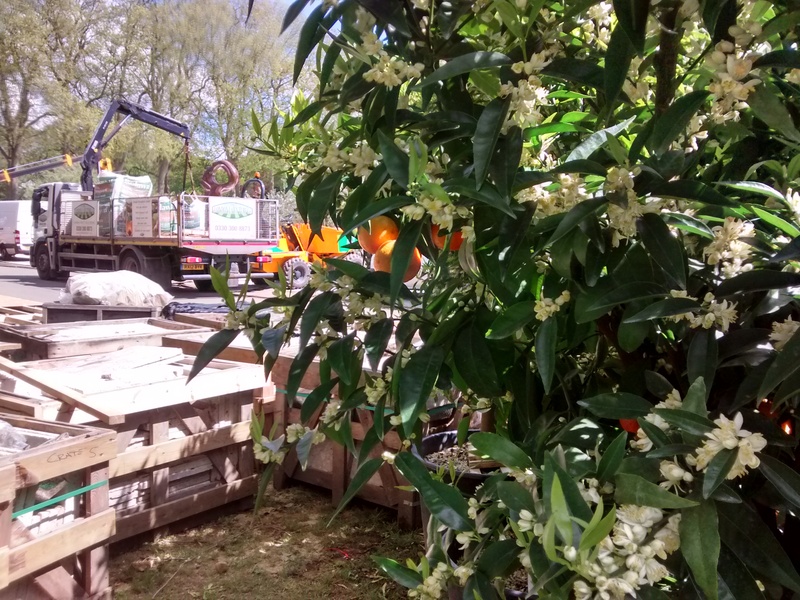 At the beginning of May, I spent four days with James Basson and his team from Scape Design helping to create a show-garden for the RHS Chelsea Flower Show 2015. A hugely talented designer based in the south of France, James specialises in creating gardens that fit timelessly into the local landscape. 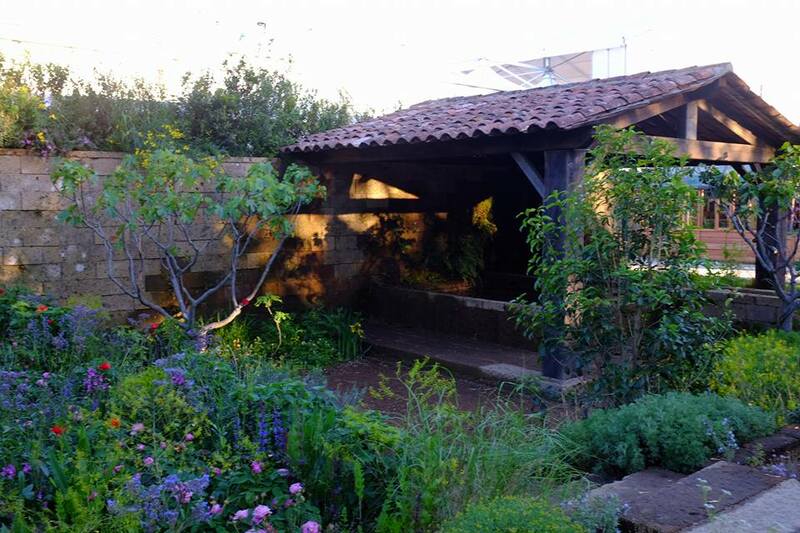 He had already won a gold medal at the RHS Chelsea Flower Show in 2013 with his garden of garrigue plants called ‘After the Fire’ and in May this year he was back, again drawing on inspiration from his local landscape to build ‘The Perfumer’s Garden in Grasse’. The traditional perfume industry in Grasse has been in decline for many years, but is now being resurrected by new companies such as L’Occitane, the garden’s sponsor. James imagined a garden full of the plants used by the perfume industry in Grasse including roses, lavender, rosemary, figs and citrus. 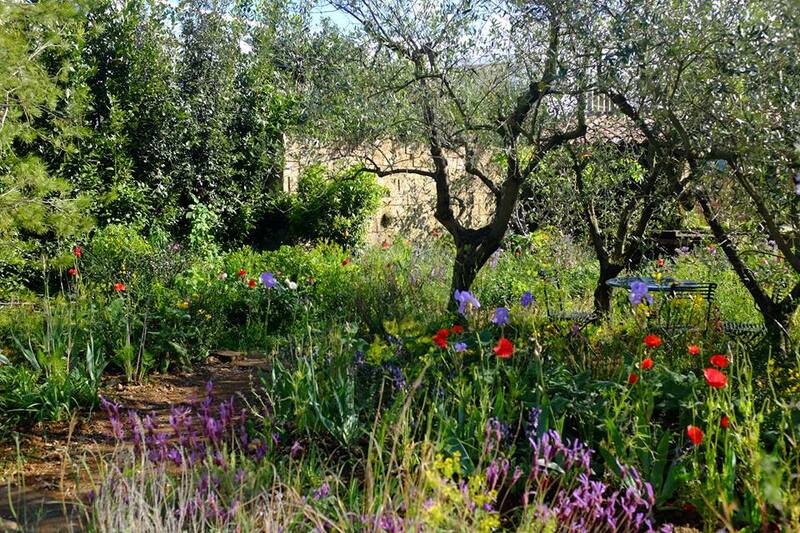 In his brief, challenging the usual expectations of a “perfect” Chelsea show garden, he described the garden as being wild and abandoned, but full of the scents of Grasse. 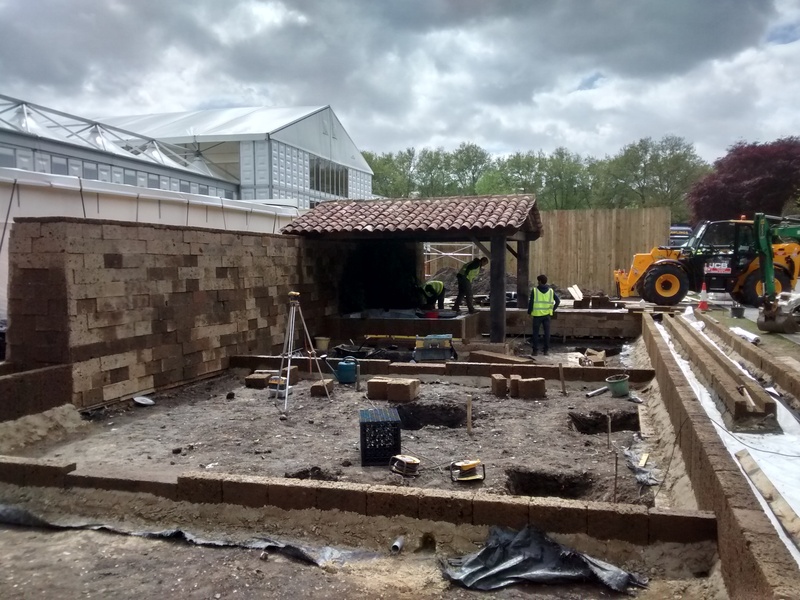 When I arrived at Chelsea on the 5th of May, a full 19 days before the show opened, James and the hard landscaping team had already been hard at work over the Bank Holiday weekend building the lavoir and tufa walls and rills. Donning my fluorescent vest and steel toe-capped boots I set to work. One of my first tasks was to artificially age the walls and rills with a mix of charcoal and water. The stone James chose is tufa, a soft porous stone found frequently in the construction of working buildings around Grasse. The transparent black stain was quickly absorbed, without masking the stone’s golden colour, marrying together the individual blocks. I found that sloshing the mix on, Jackson Pollock style, was the best approach. At the end of the lavoir, I poured the black stain along the rainwater gully James had designed along the top of the wall. This gave the impression that the run-off from the roof had been staining the wall over many years. The attention to detail in this garden was incredible. The next job was to recreate lichen growing on the walls, steps and rills, again with the aim of giving a feeling of great age to stonework that had only been built days before. 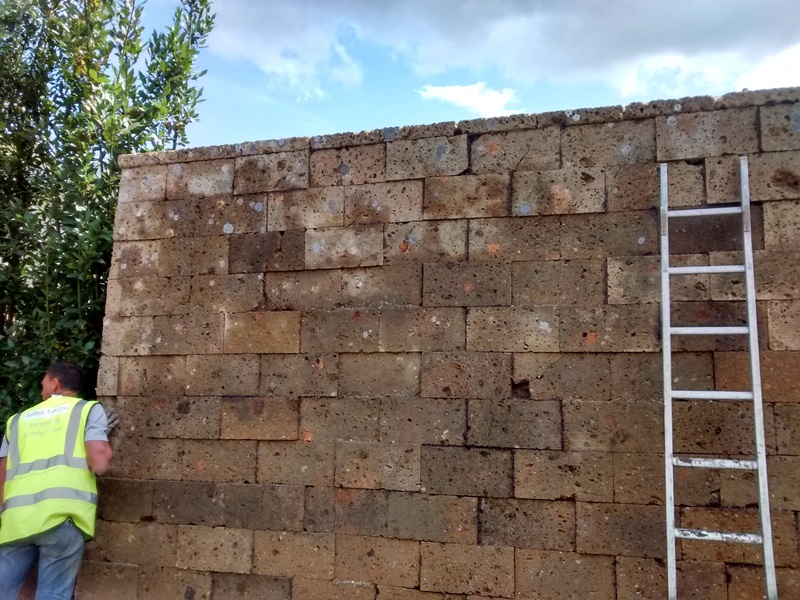 Real lichen is growing on the roof tile on the right and our first attempts to recreate it, mixing lime, water, soil or curry powder, cover the slabs of tufa front and left. I kept modifying the lichen all week. Scraping it off, daubing it on again, trying not to be too regular and aiming for my blobs to look like lichen, not chewing-gum or bird droppings! 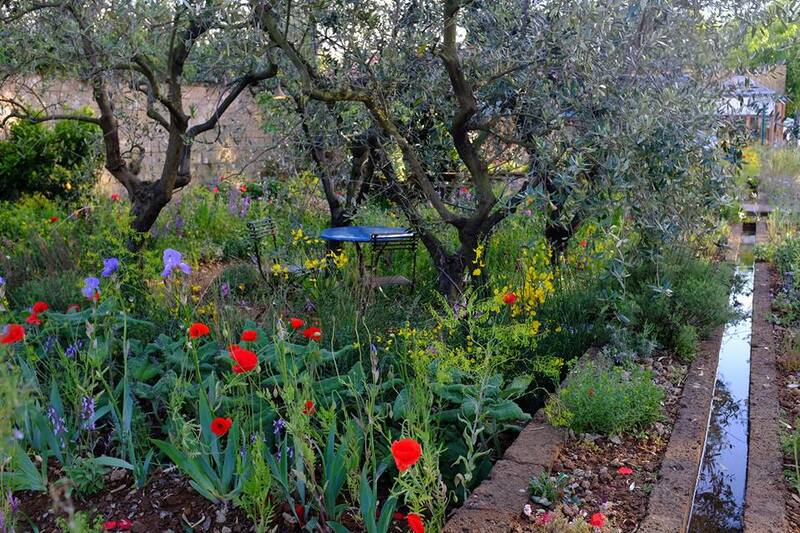 Sharon Simonson, a fellow volunteer, is an experienced gardener who lives and works near Grasse. An olive tree expert, she pruned the trees once they were in place and rubbed the end of every cut with charcoal to make it look weathered. Here she is, up a ladder, pushing soil collected from the countryside near Grasse into the joints in the walls. James collected buckets of soil and leaf mould from the garrigue; just the top centimetre or so. The wall was then watered, twice a day, until the seeds in the soil began to sprout, again giving a feeling of permanence. Below Sharon I am covering up any visible nail heads, which attach the stone to the wooden frame behind, with a mix of cement and crushed tufa. This is the second-pass at getting the lichen on the wall looking right. Natural lichens colonise the sunniest parts of walls and our fake lichen was most dense at the highest most southerly part of the wall. Some of the lichen here was too grey and got scraped off again, but each scraping added to the aged patina we were trying to achieve. 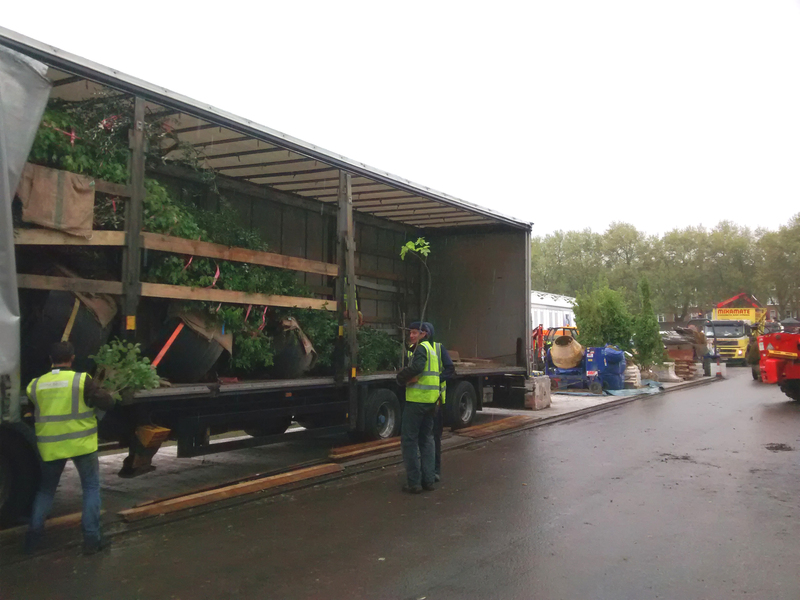 Just as we were sitting down to lunch at 2pm, our first lorry-load of plants from France arrived. As we scurried back and forth, stocking the plants opposite the garden, the heavens opened and it poured down, but the plants loved it having been cooped up in a lorry for a few days. 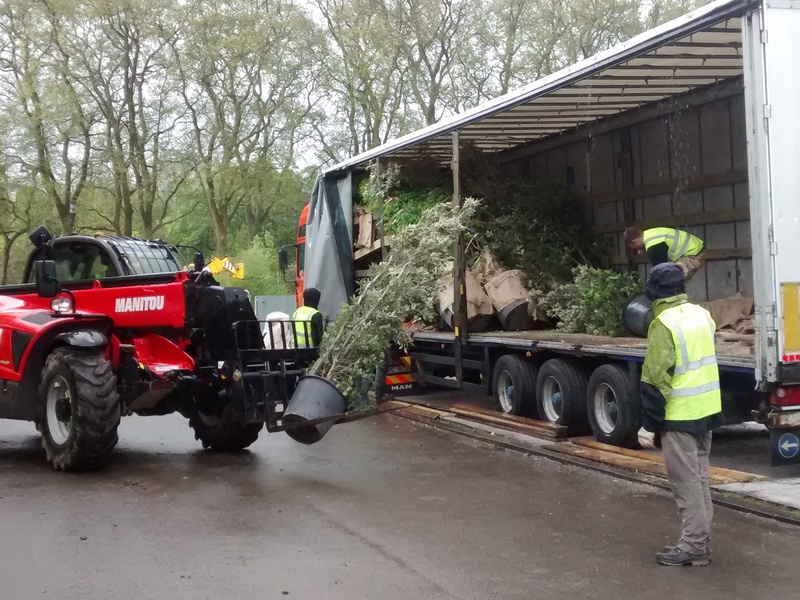 As soon as they were unloaded, in spite of the rain, all the plants were given a good watering. The big pots you can see are the four olive trees. James is carrying a very young fig tree that he brought with him from France. In order to get a natural wild effect, he also planted specimens that he found in the wild, self-seeded and leggy, something you almost never see at Chelsea. 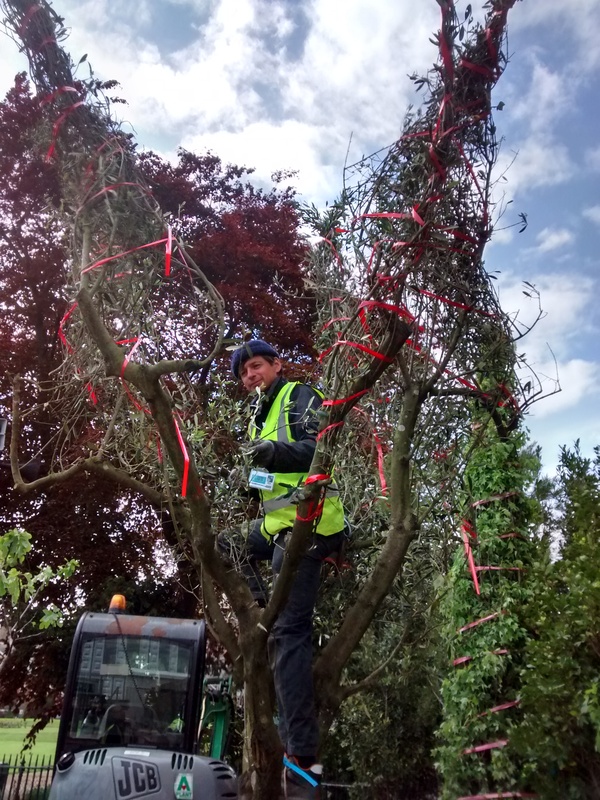 James, up an olive tree, removing the red plastic ribbons used to protect the tree during transport. We did this straight away to give the trees as much time as possible to regain their natural aspect. The RHS were not pleased to see us climbing trees and we were advised to use a ladder. The RHS team were great, really friendly and helpful, though firm with the health and safety guidelines. After a few days, everybody gets to know each other, from the RHS organisers to Mo who directed the traffic and the unloading of deliveries in our section. 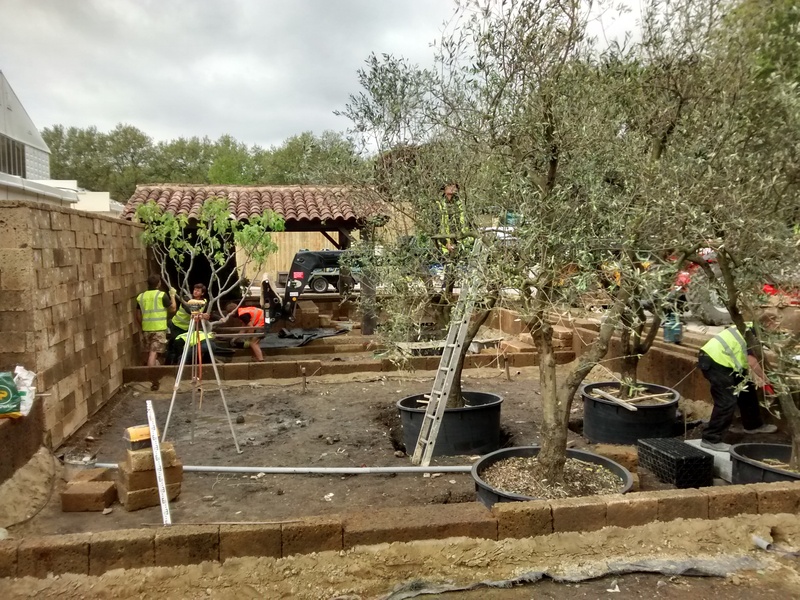 The four olive trees and a fig are manoeuvred into place. If you look carefully, you can see Sharon in one of the olive trees, this time with her ladder. 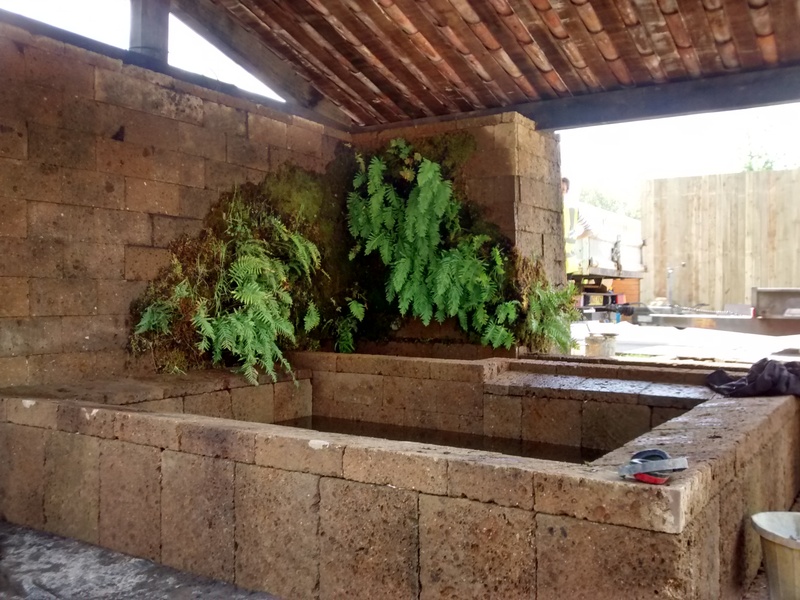 James brought a mat of moss and ferns from France which were attached to the interior wall of the lavoir and then watered two or three times a day for the next three weeks. Lavoirs were traditionally used for washing clothes and can still be found in many villages and private gardens in France. This lavoir looks ancient, as though it has been dismantled and reassembled, but in fact it is only a few days old. To make it look authentic the timber was aged and blackened using a secret recipe and lichen-encrusted reclaimed terracotta tiles were used for the roof. Sometimes Chelsea is more like a film-set than a garden show. 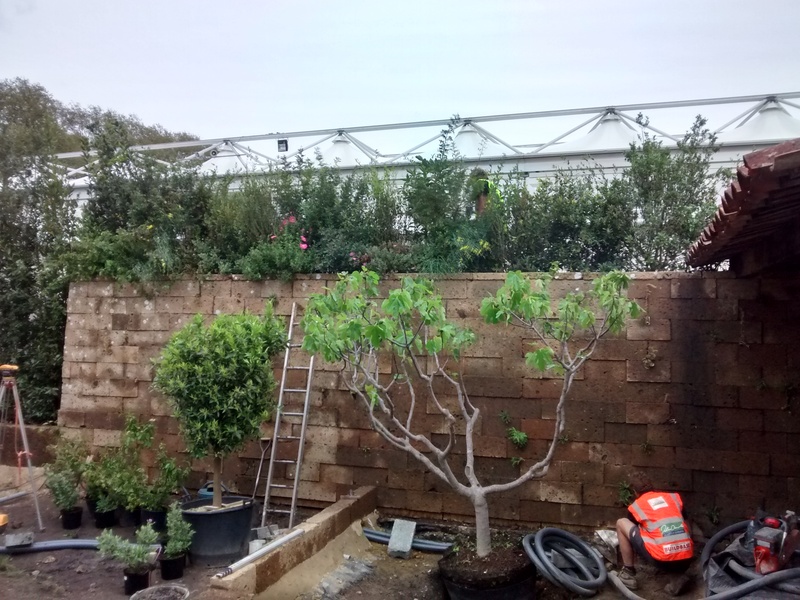 The fig tree has been planted and the crushed tufa paths are being spread. 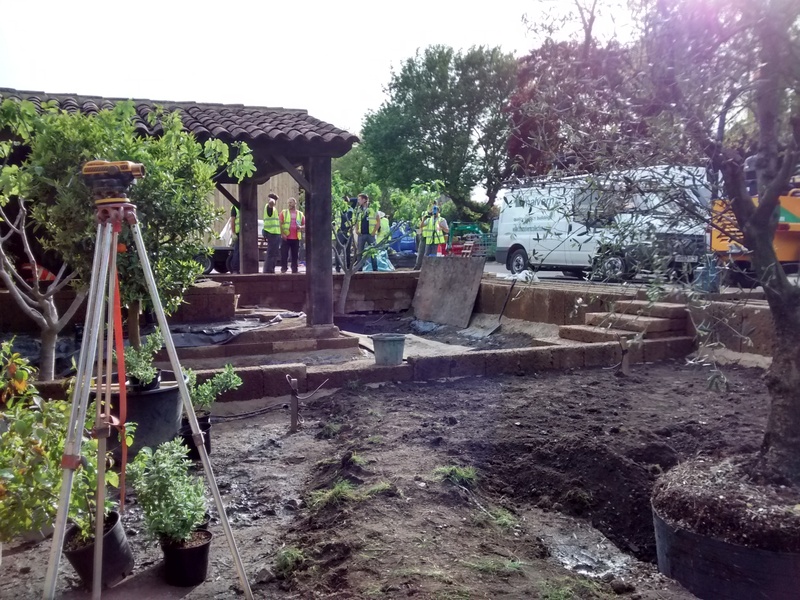 The team from Peter Dowle, the landscape contractor, are lining the rill and beds before soil is added. Chelsea (a well-named volunteer) and Bruno from Scape Design look on. 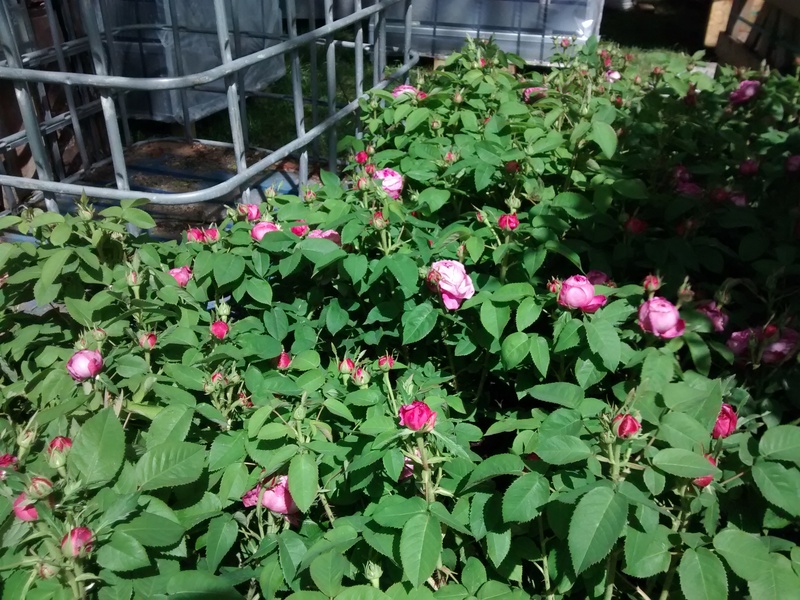 A mass of sweet-scented Rosa x centifolia sit waiting to be planted. This rose, also known as the Provence rose, has been used for centuries in the Grasse fragrance industry for the production of rose oil. The scent of the blossom of this bitter orange, Citrus x aurantium was almost overpowering. Not only useful for making marmalade, it is cultivated in Grasse for making neroli oil which is distilled from the flowers. The final levels of the topsoil are established and the tops of the olive containers cut back. A wobbly step is relaid and lengthy discussions follow initial tests of the water pump. 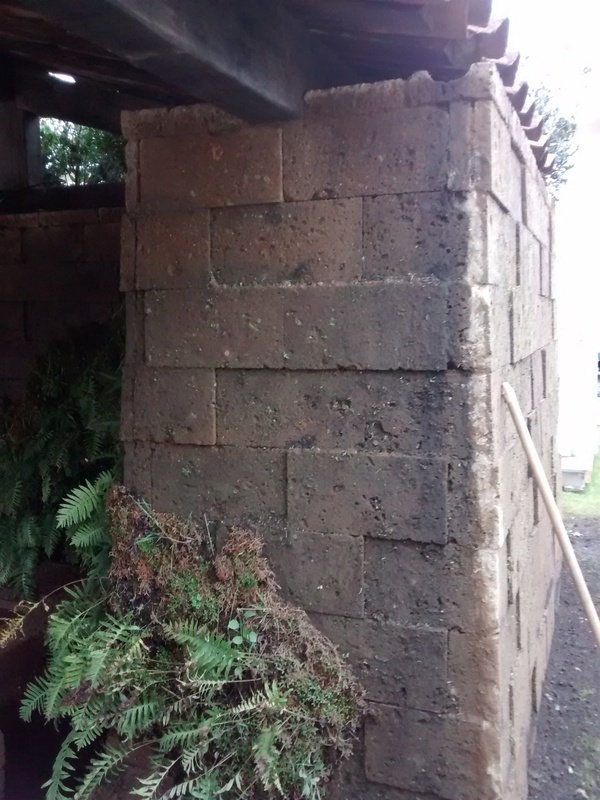 Work on the lichen continues around the planting of small plants into the cracks in the walls. These wild flowers (also known as weeds!) were carefully brought by James from Grasse. Umbilicus rupestris, a kind of pennywort, have their flower spikes propped up using long nails until they settle in and are able to stand up alone. 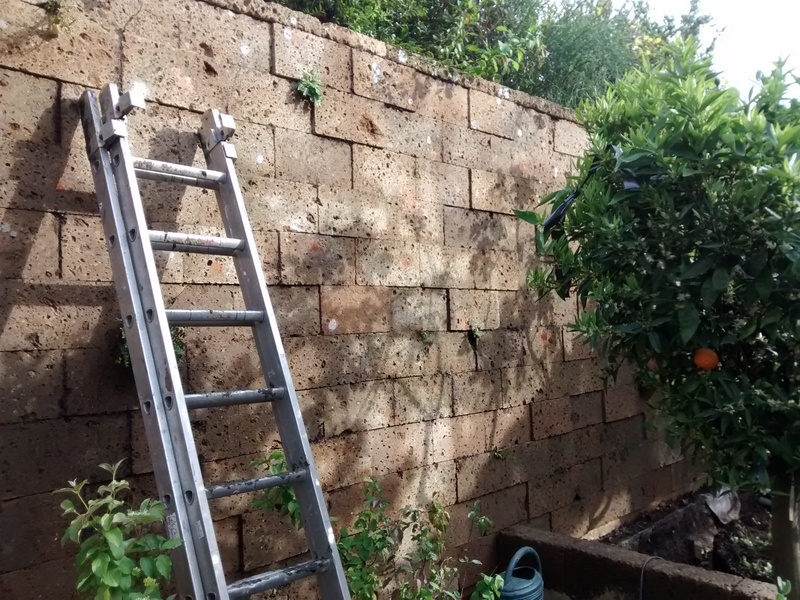 Planting starts with the tall hedge to the left and the planting cavity in the top of the wall. The plants in the wall include Cistus albidus, Cistus monospliensis and the broom found growing in the wild in Provence, Spartium junceum. Unfortunately I could only stay for four days and it was sad to leave the camaraderie of the team and to go without seeing the garden fully planted, I felt like I was leaving a party far too early. Over the next few days an even larger team of volunteers came to plant the garden and the photos below were taken by James when it was finished. What is so different about James’ garden is that it is deliberately imperfect, in direct contrast with most Chelsea show gardens. Weeds and moss grow in cracks; thyme plants still have last season’s dried stalks and flowers held alongside the new. The garden is a combination of plants in formal rows with others that appear to be self-seeded. The garden absolutely spirits you away to Grasse to a slightly abandoned garden, half-cultivated, half-wild. The atmosphere is romantic and joyous. 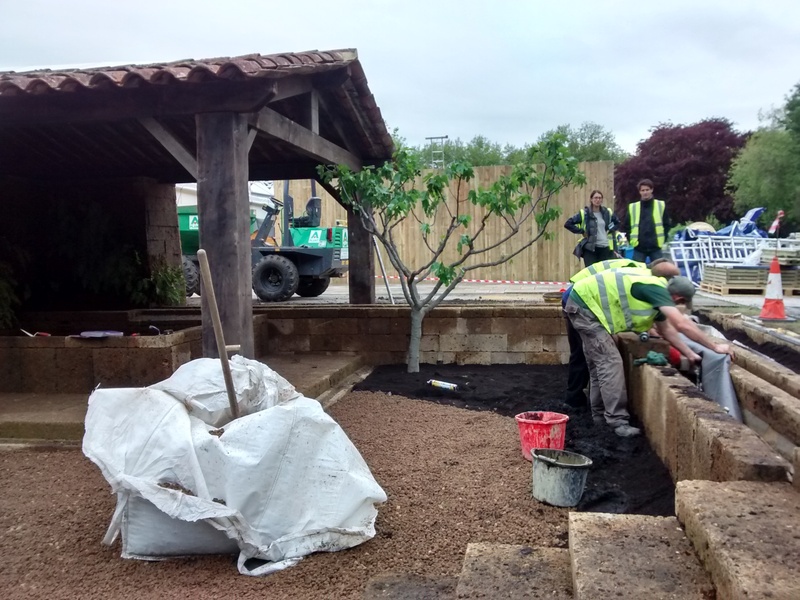 I am really proud to say that I worked on this garden, even though I was only one small cog amongst the dedicated group of unpaid volunteers working alongside James, Bruno and the friendly and funny team from Peter Dowle Landscapes. I wasn’t the only volunteer from France and the lack of a common language didn’t stop the banter or the teamwork, it just enhanced a very special experience. Here you can see the enormous attention to detail that has gone into the garden. 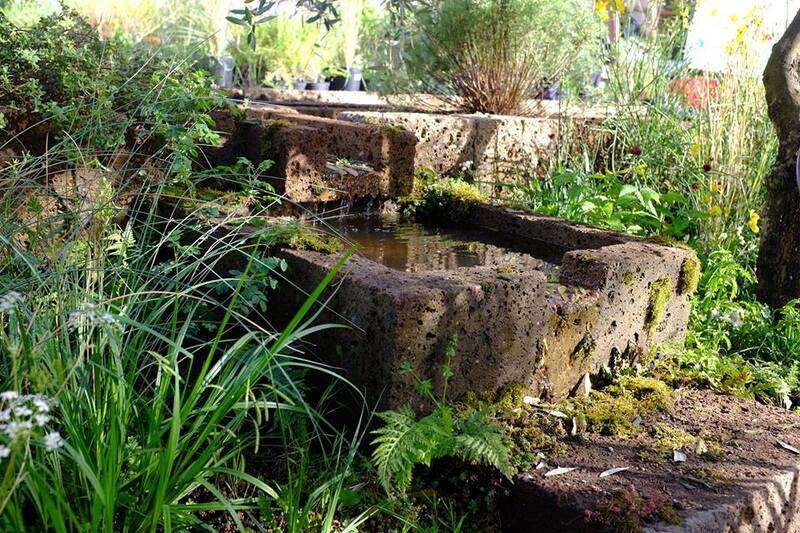 The moss and ferns in the cracks on the water basin, the naturalistic planting, the worn stone. Every tiny element has been thought through. It may be like a film-set, but it is extraordinarily beautiful. I now have nothing but huge admiration for any designer who makes a show garden at Chelsea. After a year of preparation and the seemingly impossible hunt for a sponsor, the designers and their teams work for a month, from 8am to 8pm, 7 days a week and often far away from their families. You have to have huge amount of energy, drive and talent to make it all happen, let alone win a medal. 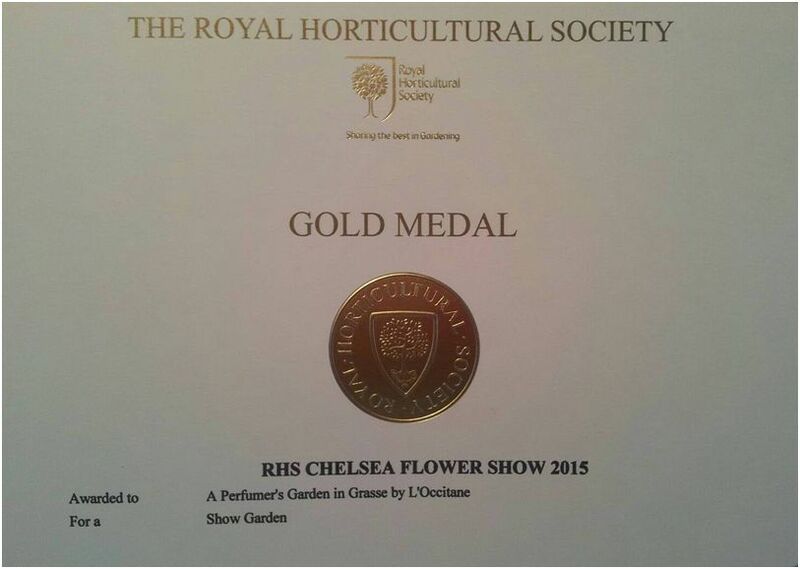 But I’m sure you won’t be surprised…..the garden won a very well deserved GOLD! For more information about James Basson and Scape Design, follow this link to their website and contact details. The landscape contractors were Peter Dowle at Howle Hill Nursery . The garden was sponsored by L’Occitane UK and we were grateful for their gifts of hand-cream to soothe our work-worn hands. Lynda Harris is a landscape architect and garden designer based in Paris. I thought this was one of the top gardens at Chelsea this year. It held my attention over several rounds around the grounds, and I looked at the stonework over and over trying to understand what it was and how it got that aged appearance. It appears that there are some striking similarities between the Basson garden and the Dan Pearson garden in the reliance on original, imperfect materials, brought from the wild and incorporated into the garden. A wonderful piece of work, and aren’t all gardens like theater sets to some extent? Hi James, It was Dan who introduced me to James at Chelsea in 2013 when he won his medal for his ‘After the Fire’ garden which was even more inspired by nature. I really agree that they share an aesthetic of naturalism and an idea of timelessness. I’m huge fans of them both, as you know! And you a quite right, every garden is a kind of theatre set, and that is inspiring but thankfully real gardens are so much more permanent than these show gardens. I always think it is a shame that they take such effort to design and build and then are only seen for a week. Feel free to sign up for an email notification, I add a new post once or twice a month.